After The Prom, a Norman Rockwell painting , appeared on the cover of The Saturday Evening Post published May 25, 1957. This is another timeless favorite of Rockwell collectors, a classic for all the ages. 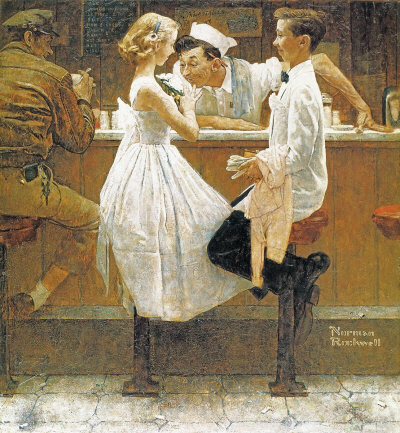 This painting was Rockwell's 295th overall out of 322 total paintings that were published on the cover of the Saturday Evening Post. Rockwell's career with the Post spanned 47 years, from his first cover illustration, Boy With Baby Carriage in 1916 to his last, Portrait of John F. Kennedy, in 1963. This was also the second cover for The Post in 1957. In 1957, there were five Norman Rockwell Saturday Evening Post covers published. The original oil on canvas painting, 31 x 29 inches or 78.5 x 73.5 cm, is part of a private collection. on page 212 of Norman Rockwell, A Definitive Catalogue by Laurie Norton Moffatt. One study also appear in the Norman Rockwell Catalogue on page 213. One of the photographs used to produce the painting are reproduced in Norman Rockwell: Behind the Camera by Ron Schick on page 184. The original painting is reproduced in full color on page 183. Norman Rockwell makes us use our imagination to piece together the evening's events before, at and after the promenade with this picture. We can only see in our mind's eye how the young suitor picked up his date. Did he wait breathlessly anticipating her descent down the staircase at her home? Her prom dress is gorgeous, after all. This takes place in the days when a date from the prom meant more than it seems to mean today. Did the couple dance every dance? Did they kiss yet or will that come later? The present scene takes place after they leave the prom. The boy is probably just about spent out after renting his dinner jacket and buying such a beautiful corsage for his date. The counterman appears to be enjoying the corsage also. Anyway, it looks like the local greasy spoon was all this young chap could afford for a meal afterwards. The prom is lots of fun, but it sure is expensive. After The Prom was only one of 322 Norman Rockwell Saturday Evening Post covers; Here is the list of Norman Rockwell Saturday Evening Post cover illustrations. In a way, the faces of characters seem somewhat caricatured, but that in no way detracts from the painting and its story. The fellow on the left who looks like he might be a cab driver also appeared in the left margin of the previous painting, Red Sox Locker Room, also called The Rookie. The model's name is not known. Do You Have A Great Story, Opinion Or Contribution About After the Prom?